When the clients chose to leave New York City for the suburbs, they wanted their new lifestyle to retain a strong sense of community. 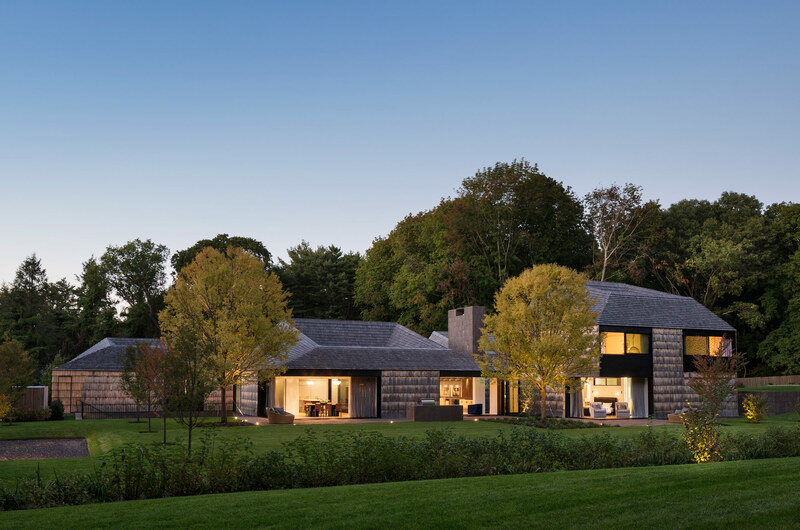 Inspired by the tenants of simplicity, humility, and inner focus espoused by the Quaker history of the surrounding community, the house is characterized by a series of modest gabled structures, each of which turn inward toward a central courtyard. The surrounding plantings, metal ceilings, oak floors, and ceiling boards radiate outward from each central courtyard to further emphasize this geometry. Behind the perforated and corrugated zinc of its exterior, this renovation of a 1900s Williamsburg townhouse radically remakes the interior to create a double-height living room and a hovering addition that allows for parking underneath. This simple, barn-inspired structure is the centerpiece of a sustainable compound that includes a rehabilitated barn, a natural pool, and a three-story screened tower with a wood-burning sauna. Receiving light from all four sides of a Manhattan dwelling is a chance that seldom comes along. So Bryan Young, principal-in-charge of New York studio Young Projects, took full advantage with the Gerken Residence. Occupying the 13th and 14th floors of a historic cast-iron Tribeca building, the apartment’s 1,500-square-foot rooftop offers downtown views—notably of Frank Gehry’s 8 Spruce Street—while its roughly 6,000 interior square feet host a lush cutout courtyard and a collection of private, yet fluidly connected spaces. Inside, the most eye-catching element is a polished stainless-steel screen found on the main floor. Divided into segments, it can be moved from one side of the building to the other, creating a partition across the space. Cuts made in the twisted, shimmering steel create a visually semipermeable membrane. Subsequently, guests can have restricted or open views depending on the position of the screen: It provides more privacy and opacity when viewed from the elevator entry, while it is more open and transparent when viewed from the living room. This divider, Young explained, is one of four key spatial elements that organize the program on the 14th floor residence. Three of these—the fireplace, the courtyard, and the screen—can be found arranged around the fourth element, described by Young as the “plaster core,” a sensuously textured volume that houses the back-of-house programmatic elements and allows the rest of the apartment to be more open. Like many research projects in the office, the concept was born from a series of questions about the possibilities of new materials and the process of making. Young emphasized that the final product is not pulled plaster, but rather an arrangement of plaster casts. To create the effect, Young said, six “master molds” were created using a variation on the traditional technique used to make crown moldings. Here, a custom designed profile, or “knife” and “horse” were moved back and forth laterally, pulled along the length of the custom designed rail to form the plaster in three dimensions. Done by hand, the technique produced casts where serrated edges peeled away in an S-shape, giving way to a contrasting smooth surface. These were then used to create the six master molds, which were used to make the casts that clad the core. The plaster allows the core’s interior facade to respond to the surrounding spatial elements. More dramatic, “aggressive” casts were employed on the volume’s double-height spaces, most notably by the stairway, which is exposed to direct sunlight, while less articulated, “softer” casts were distributed elsewhere. The courtyard or “glass core” lies opposite the plaster core and bathes it and the stairwell in light. “As you move around the house, what initially reads as a negative element starts to read as a positive volume,” Young said of the courtyard. Working with landscape design firm Future Green Studio, it is filled with vegetation that hangs from the rooftop. Young intends for this visual connection to strengthen over time as the greenery piles over, offering a rare dose of thriving interior vegetation in an urban apartment. The spatial organization of an interior courtyard juxtaposed with a solid, materially ambiguous interior wall gives the projects its raison d’être: The courtyard’s plants glow with light, questioning familiar notions of interior and exterior, much like the transformation of plaster gives new characteristics and life to seemingly familiar materials, taking all of it almost into the realm of the unreal. 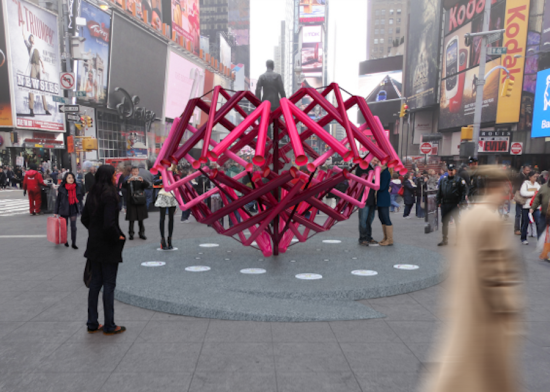 Brooklyn-based Young Projects have been announced as the winner of the annual competition to design a Valentine's Day themed installation in Times Square. Times Square Arts, the wing of the Times Square Alliance responsible for public art programs, worked with the Van Alen Institute to select this year's design, which will go on display in early February. In the proposed scheme, dubbed Match-Maker, visitors position themselves at one of the twelve distinct viewing points corresponding to their own zodiac sign. 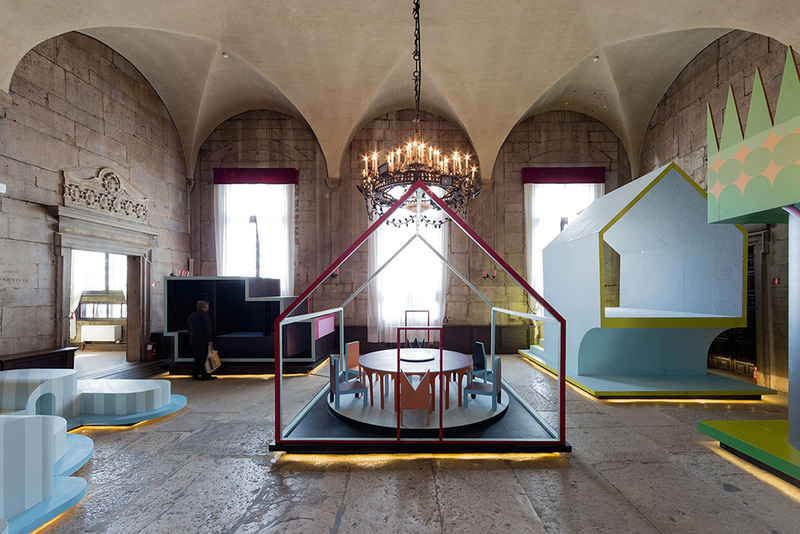 By peering into the pink periscopes that create the heart-shaped structure the viewer is visually connected to the four most ideal mates amongst their fellow participants as dictated by astrological correspondence. Fittingly for a holiday that often produces drastically different emotional reactions, the installation's form is elusive and shifting. At times it reads as a fully-formed heart while from other vantage points it appears to be a jumbled mass. 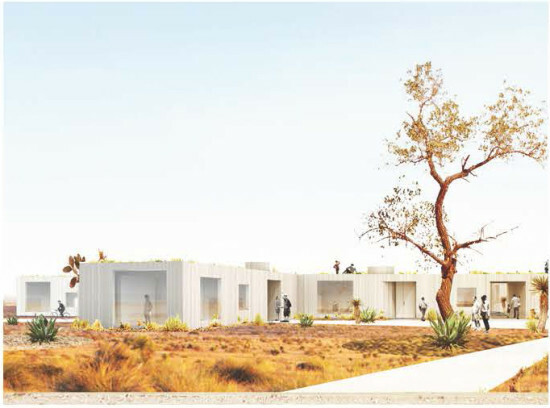 Young Projects join Situ Studio (2013); BIG (Bjarke Ingels Group) (2012); Freecell (2011); Moorhead & Moorhead (2010); and Gage / Clemenceau Architects (2009) as firms to have won the competition. The heart will remain installed through mid-March.